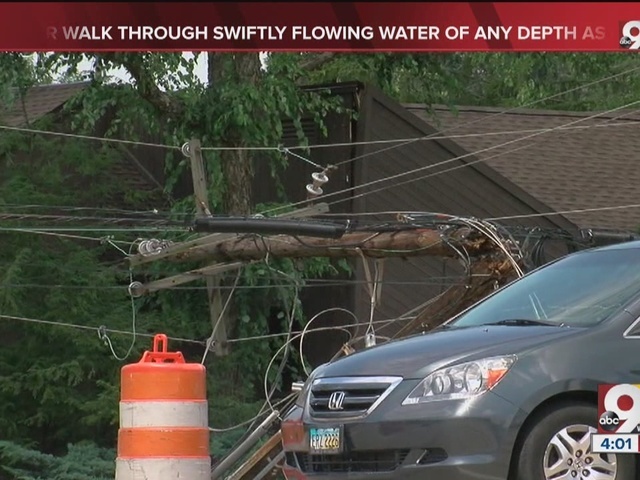 ANDERSON TWP., Ohio – Downed power lines trapped several motorists in their vehicles and cut off power after an accident in the 7600 block of Five Mile Road Wednesday afternoon. “Heard a big crash and a crack and next thing I knew the wires were down on the car and we stopped,” said Beth Beineke. Another driver, Todd Redding, said he saw what happened. “The truck in front of me hit the power lines. (They) came down, hit the front of our car and the whole pole cracked," Redding said. "Then we were stuck in there because the Duke gentlemen told us there was a live wire under my car." Redding and his son were trapped in their minivan for about 45 minutes without power and air conditioning until Duke Energy crews turned off the electricity. "It was a sauna. It was pretty hot in there,” Redding said. The accident closed Five Mile between Beechmont Avenue and Nimitzview Drive and left many Duke customers nearby without power for hours. A dump truck dropping off a load of gravel for road work crews clipped the power lines first, then a tractor-trailer added to the damage. “A tractor-trailer came through and pulled the wires down ... and three cars got caught up in it,” said Anderson Fire Chief Sean Smith. The downed wires caused minor dents and scratches to the vehicles, but no one was hurt. There were some tense moments, though, Beineke said. “A little bit racy in the heart, but I knew everybody was OK 'cause everybody was giving the thumbs up,” she said. The road opened up again Wednesday evening at 8:45.